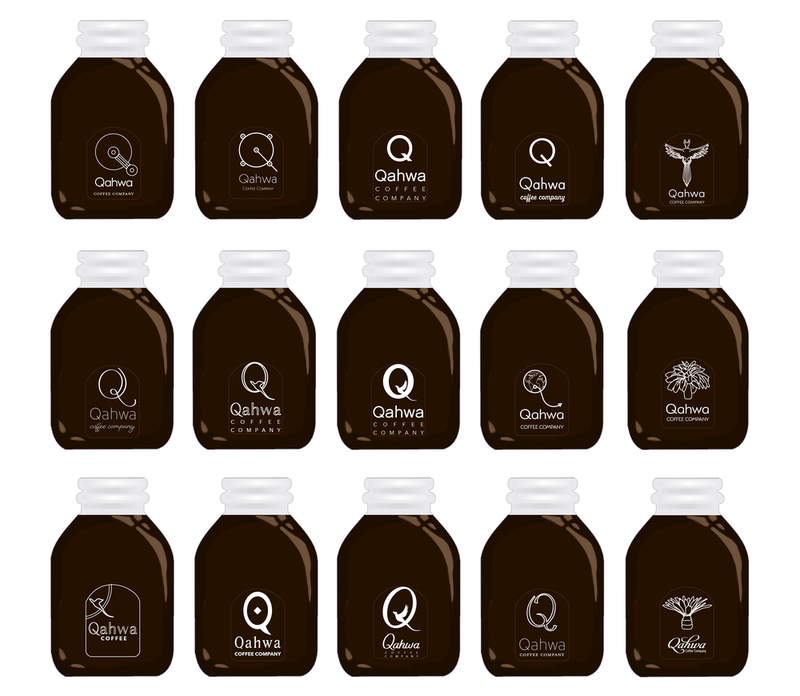 This branding and packaging design was for a startup organic bottled coffee company called Qahwa, which is the Arabic word for wine. Their first design team had mysteriously disappeared and left them without the original design files, and I was brought on to not only fill the role that had been left but also to propose a new logo and layout for everything they wanted on the bottle. On the bottom right corner of this page is the original bottle design, with the name of the company written out in a fairly unreadable and illegible script. When I was brought on, I was asked to think broadly about what kinds of designs would work for a new logo and how to make the company name nicely readable. The words used to describe the brand were “high-end”, “exclusive”, “exotic” and “trendy”. 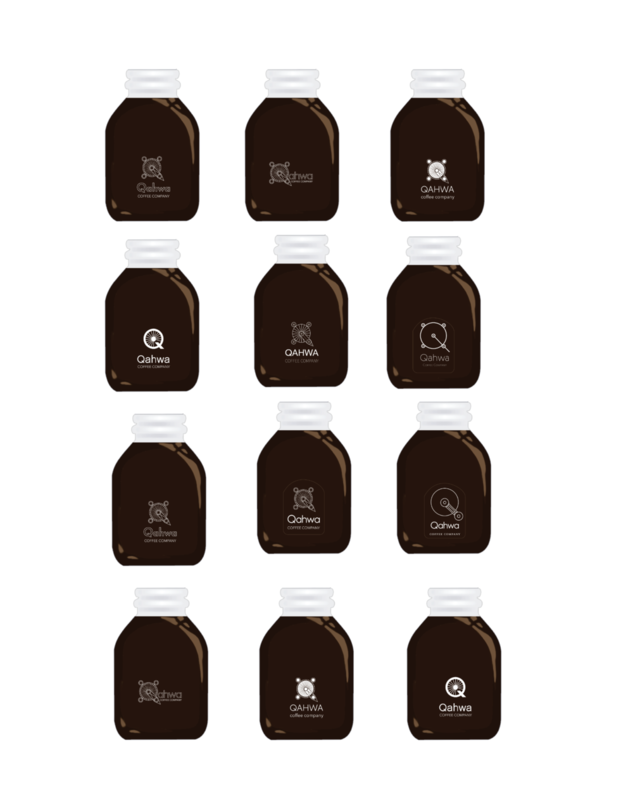 Everything I designed would have to fit inside the small window of printing space on the bottles. The original design, with a "batch tag" or flavor profile as a sticker on the left. The biggest challenge, as I saw it, was making the letterforms readable. The letter Q is very unique and somewhat baffling on its own in certain typefaces. It can look more like a 2 or an O when written out, and a lot of the time the only way we know what letter we’re seeing is because it’s followed by a U. In this case, there is no U after the Q in Qahwa, so it was paramount to find a typeface with a very distinct Q letterform. This was a collection of typefaces I put together where the Q letterform is distinctly readable. My logo brainstorming involved looking at Arabic architecture, motifs and mythological creatures. Below are sketches and illustrations, many of which are based on a mythical creature called a Simurgh, which supposedly had the body of a dog, the tail of a peacock, the wings of an eagle, and the feet and claws of a lion. I was also inspired by the Hagia Sophia in Istanbul, and used an aerial view of that structure to create a Q shape. Because I was given such a wide berth initially, I also sketched out some coffee plants and a couple palm trees. Below is the first pass of designs I completed in Illustrator, based on the sketches of the previous page. In addition to the sketches I had already done, I also added my own Q letterforms, a Simurgh’s sillhouette flying over the moon, and a globe with an arrow going out of it to represent the journey of the beans to the customer’s bottle. After showing the clients my first round of illustrations, they asked me to continue with the Simurgh and Hagia Sophia motifs. Ultimately, the company decided to go in a different artistic direction. Below is my proposed final design, which was the most architectural and detailed version of my Hagia Sophia Q’s. “Coffee Company” is set in Avenir Light with a tracking of 45 pts. The color scheme I proposed was based on the colors of coffee and the available cap colors through the manufacturer the company was using.